This interesting and unusual surname is a patronymic of Ewan, which is of Scottish origin, and is an Anglicized form of the Gaelic personal name "Eogann". This is now generally acknowledged to be a Gaelic form of the Latin "Eugenius", from the Greek "Eugenios", well-born, noble, but it was formerly widely believed to be a form of John, derived from the Hebrew "Johanan", Jehovah has favoured. Attempts have also been made to derive the name from a proto - Celtic name; meaning "born of the yew". The personal name was first recorded as "Ewen" and "Ewei" in the Domesday Book of 1086 for Herefordshire. 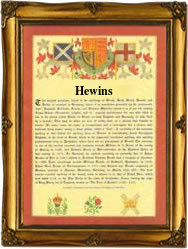 The modern surname can be found as Ewan, Ewin(g), Hewin and Yewen; the patronymics include: Ewens, Ewin(g)s, Youens, Eunson and Hewins. Among the sample recordings in Scotland are the marriage of David Eunson and Jean Duncan on May 25th 1758 at Old Machar, Aberdeen, and the christening of James, son of William Eunson, on June 7th 1743 at Banchory Devenick, Kincardine. The first recorded spelling of the family name is shown to be that of Walter Ywain, which was dated 1202, in the "Pipe Rolls of Warwickshire", during the reign of King John, known as "Lackland", 1199 - 1216. Surnames became necessary when governments introduced personal taxation. In England this was known as Poll Tax. Throughout the centuries, surnames in every country have continued to "develop" often leading to astonishing variants of the original spelling.